1he final means of preparing for emergencies is by tonsuring that appropriate emergency drugs and equipment are available in the office. One. 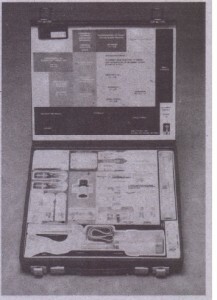 basic piece of equipment IS the dental chair that should be capable of all offering the patient to be placed in a flat position or, even better, in a head-down, feet-raised position (Fig. 2-1, A). In addition, the chair must be capable of being lowered close to the floor to allow BLS to be performed properly. Operatories should be large enough to 1I0wa patient to be placed on the floor for BLS performance and provide enough room for the dentist and others to deliver emergency care. If the operatory is too small to allow the patient to be placed on the floor, specially designed boards are available that can he placed under the patient’s thorax to allow BLS administration in the dental chair. 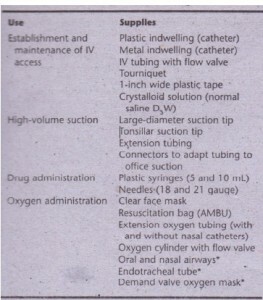 AMBU, Air Mask Bag UNIt. use or for others called’ into the office to assist during an emergency. from nearby professional, they may also want to include drugs in their kits that the assisting individuals suggest may be helpful. The drugs and any equipment in the kit must be well labeled and checked frequently for completeness and to ensure that no drugs have gone out of date. Labeling can in dude not only the drug name but also situations in which the .drug is most commonly used. 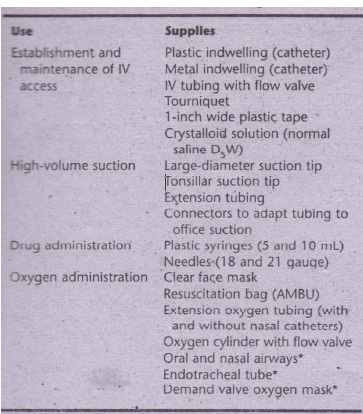 A list of drugs that should be considered for neclusion in a dental office emergency kit appears in Table 2-2.
appropriate size and complexity for dental office. available. Dentists who use a central oxygen system also need to have oxygen available that is portable-for use outside of the operator, such as in the waiting room or during transport to an emergency facility.